RENO, Nev.-The Reno Aces jumped out to a 7-1 lead after three innings and never looked back Monday night, topping the Colorado Springs Sky Sox, 10-6, at Aces Ballpark. The Aces plated four runs in the first, two in the second and one in the third to take a 7-1 lead they would not relinquish. Cody Ransom drove in all three of his runs over the game's first two frames, helping Reno chase Sky Sox starter Daniel Perkins after just 1.2 innings of work in his first-career Triple-A start. Colorado Springs fought back, cutting the lead to 7-5, but Reno tacked on three runs in the eighth to preserve the victory and maintain the league's best record after the first three series of the season. 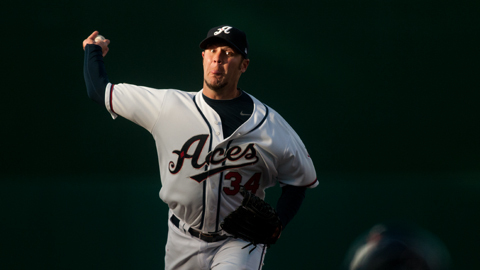 Aces starter Micah Owings (2-0) earned the victory, improving to 20-3 in his minor league career. Owings allowed three runs-two earned-in five innings, striking out three and walking three. Jordan Norberto tossed two scoreless frames of relief to extend his shutout innings streak to 19.2, dating back to last season. Perkins (0-1) was tagged with the loss for the Sky Sox, allowing six earned runs while striking out one and issuing five free passes. Tony Abreu extended his season-opening hitting streak to 11 games, and Wily Mo Peña chipped in with a pinch-hit, RBI single in the eighth inning to raise his average to .444. Reno opens a four-game set with the Sacramento River Cats Tuesday evening at Aces Ballpark. The Aces will send RHP Kevin Mulvey (0-1, 16.88 ERA) to the mound against River Cats RHP Guillermo Moscoso (0-0, 0.82 ERA). First pitch is set for 6:05 p.m. PT. Aces tickets can be purchased at the Aces Ballpark Box Office, online at www.RenoAces.com or by phone at (775) 334-7000. Discount full and partial season ticket plans are available today. Visit www.RenoAces.com or call (775) 334-4700 for more information.